Apologies for the fact this one’s going to be a bit of an epic post; it covers nearly three weeks of trekking in the Everest region of the Himalayas (where pictures are in mosaic, as below, click on any of them to see full size if viewing through website rather than email). The most popular trek (by far) is the ‘Everest Base Camp’ (EBC) trek, where you walk for 8 or more days to get there, then turn around. It didn’t take a lot of research to realise that this trek is a bit of a circus and the routes can get quite clogged. Instead of the EBC , I chose the Gokyo valley. My intention was to get to Gokyo Ri, the local peak at 5357 metres. Unfortunately altitude sickness got to me at the village before, where I peaked at a ‘mere’ 4520 metres. I could have persevered, but frankly I didn’t enjoy lying awake at night with a splitting headache and feeling nauseous, let alone the more severe effects that could have ensued. Given that I was trekking alone, common sense prevailed and I reduced altitude. This didn’t, however, prevent my enjoyment in any way – it was an amazing time exploring this incredible part of the world…. The flight into the Khumbu valley is a treat in itself, where you get the first views of the Himalayas just before the slightly scary landing into Lukla airport . 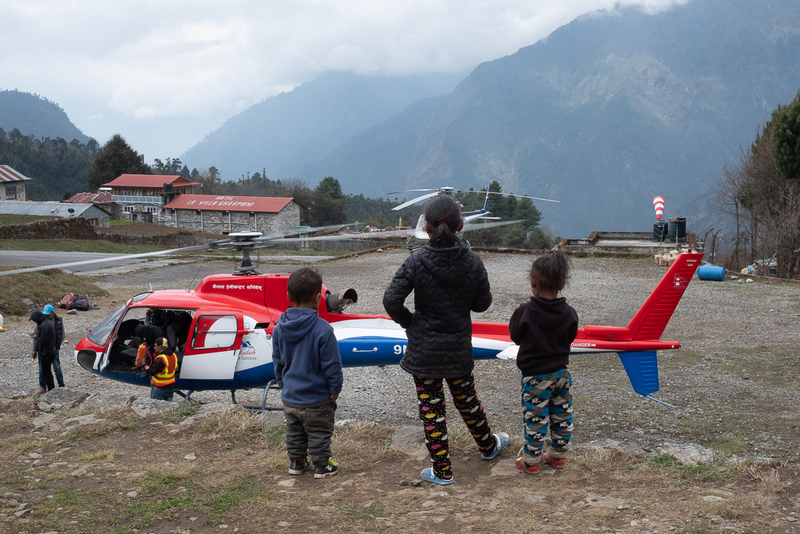 Given the number of trekkers in the region, the small planes, and the number of helicopter flights (some supplies, some rescues), the airport is phenomenally busy. This makes for great entertainment for the local kids, who get incredibly close and watch the fun. The area relies on the airport – Lukla is a three day hike from the nearest road. This is one of the things that makes the area so special – there are no lorries, cars, or bikes. Accomodation is provided in ‘tea houses’. 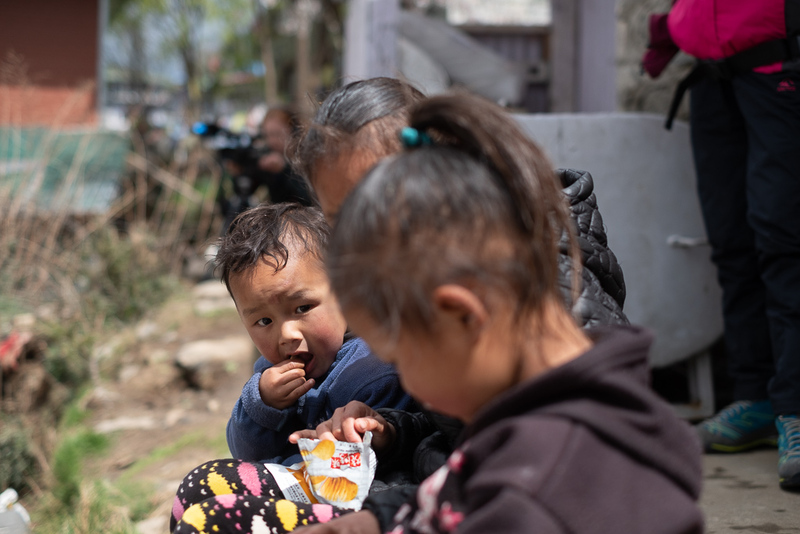 These are run by Sherpa families and are mostly basic – understandable given the logistics of getting anything transported to the area. To be honest, it’s a marvel that they exist at all. Some, however, can be relatively luxurious – occasionally you can even find a hot shower! There is no central heating, and it gets bitterly cold at night, so a good sleeping bag is essential kit. As are thermals. What they lack in luxuries, the local people make up for in hospitality however. The communal dining rooms are mostly incredibly homely. They are often run by the women, as the men are either employed in the trekking business or working away. Again, despite the remoteness (and the basic facilities), the food is plentiful and (generally) tasty. 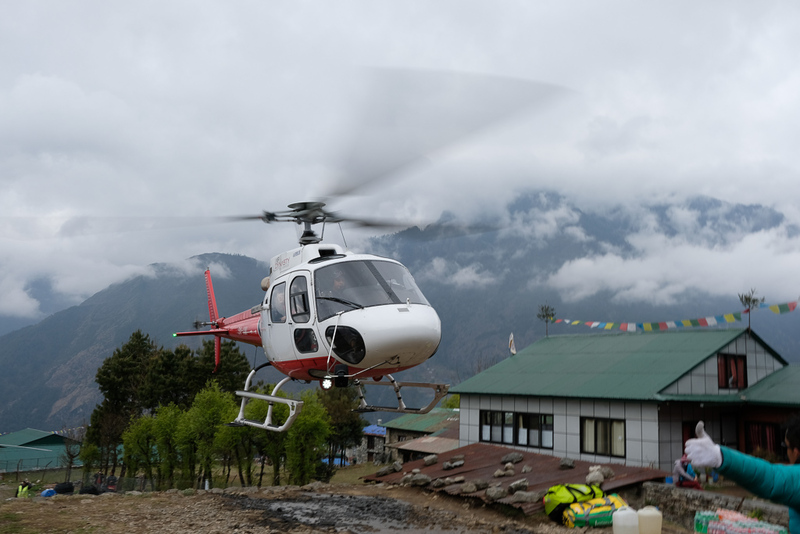 With helicopter costs being astronomical, almost everything is transported by porter or by yak. The porters carry the most incredible loads, sometimes over 100 kg, supported mainly from the head by a strap.They also carry a small pole, which they slip under their load if in need of a break.The yaks are similarly loaded. Despite being working beasts, they are often decorated and adorned. The transportation issues create an interesting economy. With each day you trek further from the airport, the higher food prices climb. It is remarkable what is available in the small shops that are run, and fun to see as the price of a Snickers bar can climb from about 100 rupees (about €0.80) to over 300 rupees (€2.30). The last proper town is Namche Bazaar (3440 metres), historically a trading town. It’s nestled into the mountains, and provides an ideal stop for ‘acclimatisation’ for a couple of nights. As you get higher, the villages become smaller, but are spectacularly situated. Of course (being South Asia) even at these heights the kids play cricket. Looking at pictures on a digital camera also provided much amusement. Whilst Nepal is predominantly a Hindu country, Buddhism prevails in this area (it borders Tibet). As a result of this, Stupas abound and most peaks are adorned with prayer flags. Villages of any size have one or more monasteries (always with a red roof) containing hand made books, some of them hundreds of years old. The Stupas are generally preceded by ‘Mani stones’, carved by devotees with the mantra ‘Om mani padme hum’ over and over (this is also generally the mantra on the prayer wheels). The piles of stones are an impressive sight, sometimes stretching over 100 metres. Whilst I stopped going up at 4500 metres, the trekking was still spectacular. Away from the Everest Base Camp trek, the paths were relatively quiet and a joy to be using. The quality of them is astonishing, with staircases literally carved out of the rock. Whenever I crossed onto the EBC trail, I was reminded that I’d made the right decision about where to trek, at times there being a long caravan of walkers (many of whom looked utterly miserable!). But it was worth getting onto the trail for a little bit, just to see Everest in the distance. And given that I was there, it would have been a shame not to indulge in a slice of cake or two from the highest bakery in the world! My mother had trekked in Nepal several times, and repeatedly implored me to travel here. I always promised I would. I now understand why she was so insistent I visit. Beautiful scenery and lovely people; the Khumbu valley is a very special place. The trek was incredible. Despite the headaches and nausea, it was a joy to finally have made good on my promise. Not sure who the guy with the grey beard was who finally made it back to Kathmandu, but he says hi to everyone…. What a lovely read. Just a tad jealous sat reading on the 06:13 this morning!! Great commentary, superb photos, (you have a great eye), you are on an amazing adventure, thoroughly enjoy reading your posts, keep well and stay safe. Looks amazing, lost in time and other worldly.. You are looking a bit sage like as well, a journey of many paths I think. Take care of yourself and stay safe Stuart. Keep it up, Stuart. And keep that beard ! Hi Stuart, educational as well as entertaining. ..think you have another potential employer in the future. ? Great eye for the photography as usual. Have a great time ! really enjoying reading your posts and your photos are just stunning, thanks for sharing your adventures! Stuart, seeing this brought back a lot of (good) memories. Glad to hear you are having a thoroughly enjoyable time. Keep up the good work. Thanks John. Suspect that nothing much has changed in many ways – it’s such an interesting country. Hope all well with you and the ever expanding family! Great reading this Stu. Keep up having a great time ! Cheers Colin, glad you’re enjoying. It is indeed a great time – feel very lucky to have the opportunity. And looking forward to getting on the bike soon! Amazing. Keep them coming! Take care! Your journey sounds fantastic . What a great time you must have!!!! It´s real fun to read your exciting stories and to view the phantastic photos. Your mom would have been delighted and happy to learn that you decided not to climb up further when suffering from altitude sickness. Enjoy your trip, take good care of yourself and stay safe! Hi Stuart – looks amazing. Not too sure about the diet though – yak curry and Snickers pie! Look forward to reading more of your adventures and enjoying the brilliant photos.